A few hours ago, we were discouraged to hear one of the anchor team members on our favorite morning show opine that Super Bowl foods “should be the foods we love to eat, not vegetables.” She was referring to the fatty, high-calorie usual suspects. Fortunately, another team member jumped in in support of the veggies. We admire people who watch what they eat, and we always have a crudités (raw vegetables) platter and a fruit platter or fruit salad as part of any party buffet. We’re also personally grateful to have something better to nibble on than cholesterol. The morning show discord inspired us to publish this recipe for a tasty, nontfat cucumber dip, adapted from a recipe provided by the Australian Institute Of Sport. TIP: Make this dip at least two hours before serving to allow the flavors to develop. It can be made a day in advance. 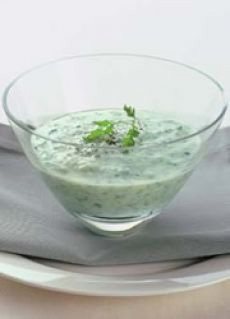 Nonfat cucumber dip: Serve it with crudites or as a sauce. Photo courtesy Australian Institute Of Sport. 1. PEEL cucumbers and cut in half lengthways. If not a seedless variety, use a melon baller to scoop out the seeds. 2. GRATE the flesh, and place in a bowl with dill, garlic, yogurt and mint. Stir to combine and serve chilled. Season with freshly ground black pepper and garnish with fresh dill, if desired. FIND MORE OF OUR FAVORITE DIP RECIPES.